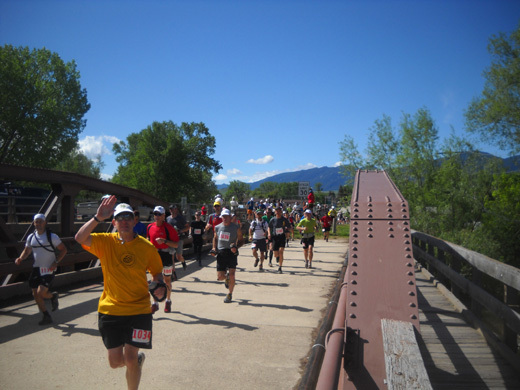 Run 2011 will be as 'wild and scenic' as you've come to expect of us." That webpage re: course conditions is probably updated annually; I don't know how long you can link to the same information I can currently see. Race officials included links for all four race distances to describe tentative changes to the courses, locations of aid stations, cut-off times, etc. They've also been providing timely updates on the message board on the site. It's interesting to read some of the comments on the board by the participants, like hundred-miler Davy Crockett's "bring on the mud!" attitude. 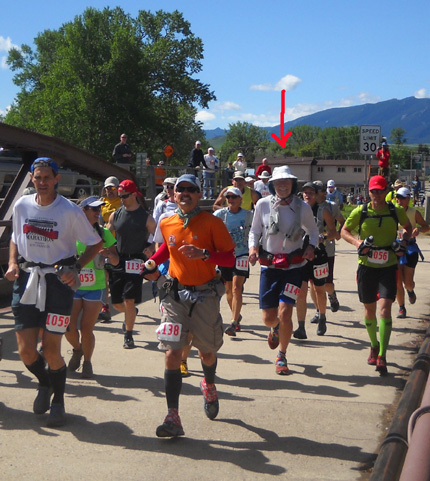 Davy Crockett (gold shirt) runs toward the Dry Fork aid station 18 miles into the 100-miler. 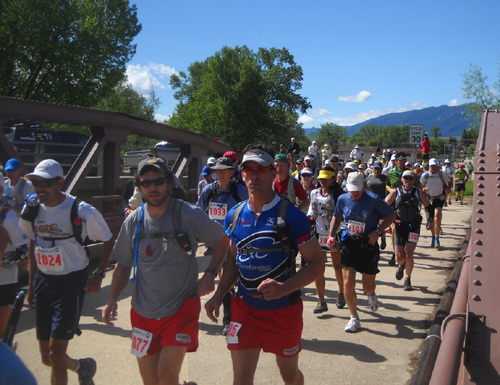 This entry focuses on the first day of the 100-miler, which began this morning. 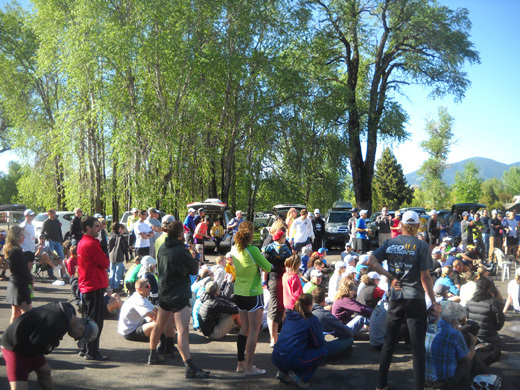 I'll include photos from the pre-race briefing, the start of the race, and the Dry Fork and Twin Buttes aid stations. 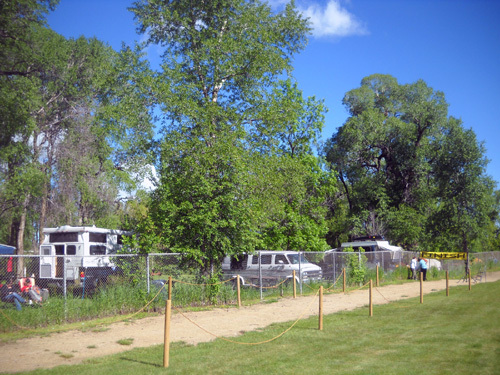 I'll also have some pictures from today of the finish area at Scott Park and the now-crowded Foothills CG next door. This week race officials put a link on their website to the alternate course map and elevation profile for the 100-miler at MapMyRun.com. Again, I don't know how long that link will remain on the site. You can read about the traditional course at this link, which is less likely to disappear. 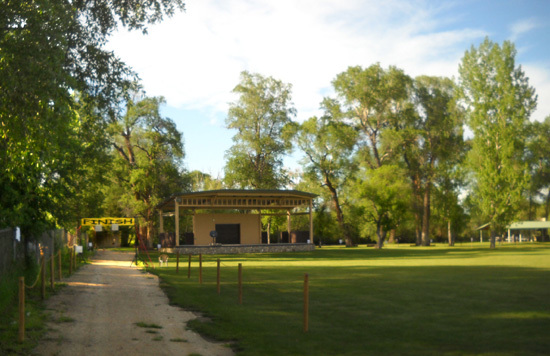 Briefly, it starts several miles out the Tongue River Road, goes mostly uphill for 48 miles to the Porcupine Ranger Station, turns around, comes back down the same way with additional mileage on the Tongue River Road, and ends up 52 miles later at Scott Park in Dayton, WY. Most of those miles are retained in the alternate course this year. The new course will be 50 miles out and 50 miles back, including two short out-and-backs to a new location in the middle of the course. 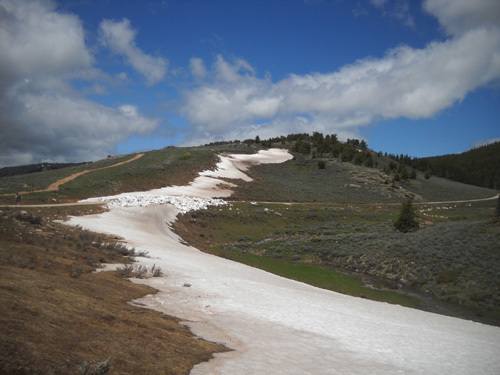 The alternate course will eliminate about eight miles out and eight miles back at the higher elevations between the Spring Marsh and Porcupine aid stations; they're buried in snow and can't be accessed by aid station volunteers. The new course compensates for those sixteen miles by adding about four miles on the Tongue River Rd. at the start and about twelve miles total on two out-and-backs to the new Twin Buttes AS from Dry Fork. The valley between Dry Fork and Kern's Cow Camp appears to be mostly snow-free now. 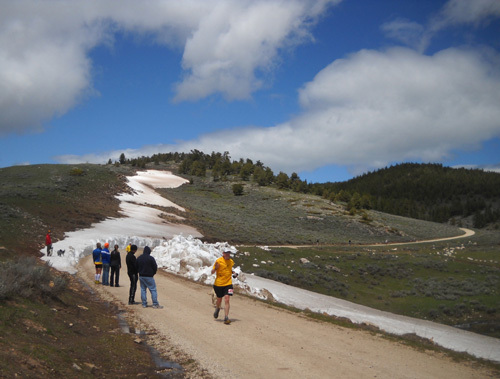 It's an easier course than the 2008 snow course that sent the 100-milers up to Riley Point from Kern's Cow Camp twice. It should also be easier than the traditional course, although there may be even more mud this time. 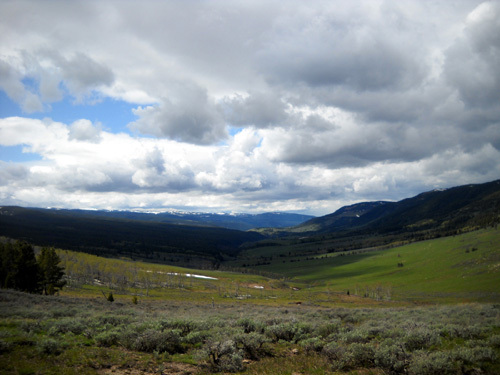 However, running a hundred miles in these mountains is never easy, even if the course was paved. The new section to Twin Buttes should be an interesting diversion for runners who have done the traditional course several times. 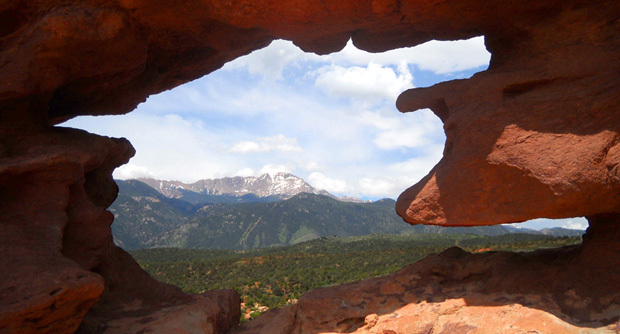 MapMyRun estimates 11,266 feet of elevation gain in the 100-miler. The race starts in Dayton at 3,917 feet and tops out at 7,936 feet. I've read on the race website that two places on the course are higher than that, however -- Camp Creek Ridge and Horse Creek Ridge, which runners in all four race distances will cover. Our GPS also says both of those ridges are over 8,000 feet. 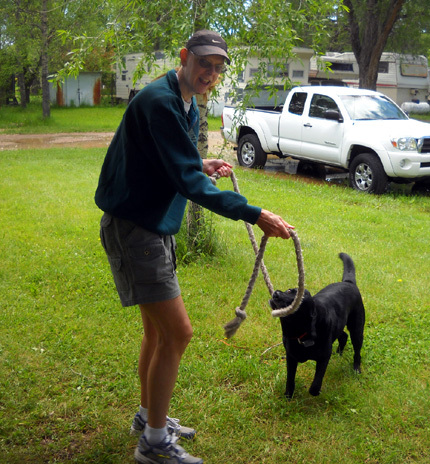 Although it was raining heavily when we went to bed last night and a couple more inches of rain were predicted to fall in the area, we woke up to sunshine at the campground this morning. That was good! If I'd been one of the 100-milers trying to sleep in a tent overnight, I would have been concerned about the weather. Today turned out to be a decent day for a long run, however, with temperatures in the 50s to 70s (depending on the time and elevation), some clouds, some sun, some wind -- but no more rain. Tomorrow should be more of the same nice late spring weather. Runners and crews gather for the pre-race briefing. Another change in the 100-mile race this year was the start time. Because of the poor course conditions (extra snow and mud) one hour has been added to finish the course. The cut-off for all four races remains 9 PM Saturday, so the 100-milers started at 10 AM this morning instead of 11 AM. 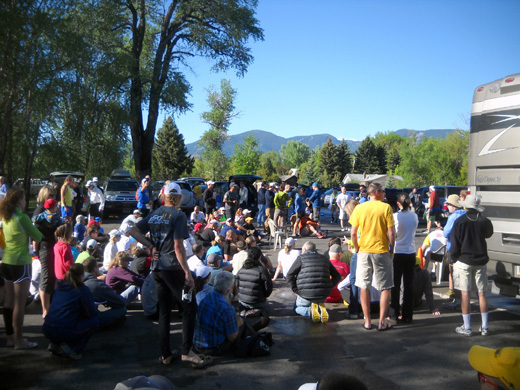 That pushed the time for the 100-milers' pre-race briefing at Scott Park to 8:30 AM. Then, instead of everyone having to drive four miles out the Tongue River Road to the traditional start line, the runners and crews walked just a couple of blocks to the main street in Dayton for the start of the race. Very efficient! I don't know if the runners liked that but crews and spectators did. Jim and I walked over to the park (next to our campground) a little before 8:30 this morning to find friends and listen to the pre-race briefing. 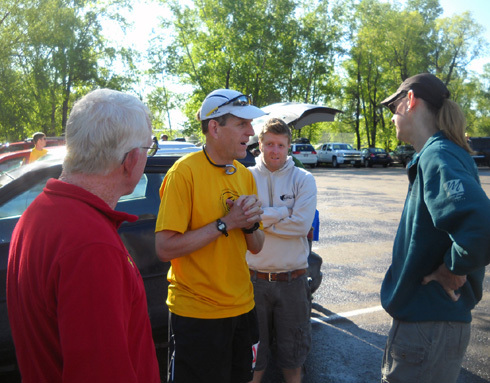 who will crew for Davy during the 100-miler. As we wished our friends well in the race I wondered aloud if Jim was envious of them or relieved he was doing "only" the 30K this time. He says he's glad he isn't in the 100-miler. He is disappointed that his knee hurts too much to run the 50-miler tomorrow; he intended it to be a long training run in his build-up to the Bear 100 in late September. Even the Bighorn 50K is too much for that knee right now. Because of flooding in the park the shelter by the river that is usually used for the briefing is roped off. The finish line, food tent, etc. will all be several hundred feet "inland." Although it's fun to finish by the river, there is more room and lots of grass at the new location. Michelle Maneval, one of the RDs, and Wendell Robison, runner and race MC, conducted the briefing in the parking area. 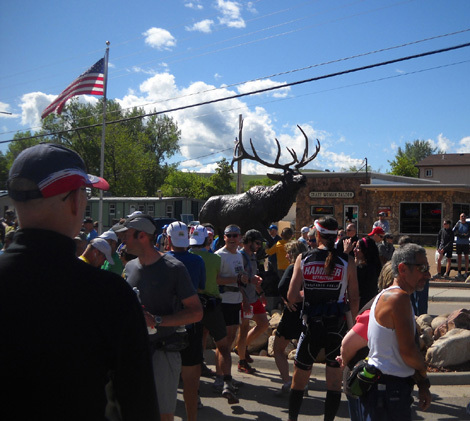 They covered the usual pre-race topics with the addition of tales about some of the larger challenges they faced this year with re-routing and clearing the course from the glut of snow, rockslides, flooded creeks, wayward boulders, downed trees, etc. I don't think the runners will be too disappointed by the changes this year. They should be very grateful that the race is even being conducted, considering all the problems Mother Nature threw at the race committee in recent weeks. Runners had about half an hour after the briefing to gather their gear and walk over to the starting line. Jim and I went back to the camper for a few minutes, then picked a spot out on the main street to watch the start. 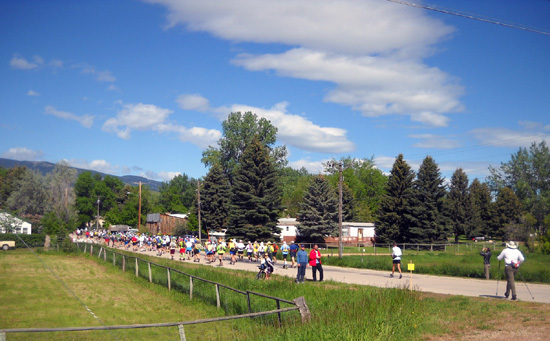 Runners gathered at the intersection of the First Street boulevard and US 14 between the Foothills CG and the Crazy Woman Saloon (this is the Wild West, remember??). There is a handsome bronze elk statue here. Before the gun went off I walked about a block away to the far end of the foot bridge the runners used to cross the Tongue River. I perched on the railing and had a great view of all the runners as they came by. Jim stood with Anne Watts at the other end of the bridge to cheer on the runners. 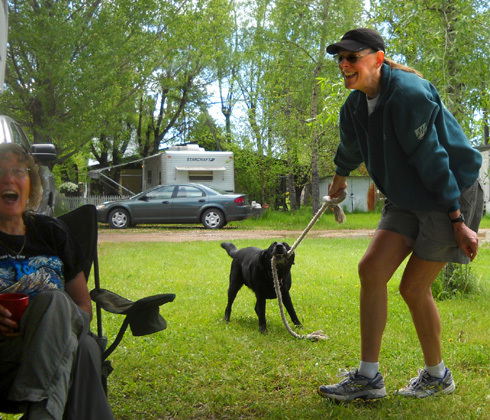 There they go, heading out the Tongue River Road on a beautiful day for a romp in the mountains. That was fun! I enjoyed seeing everyone clearly and giving the runners words of encouragement while I snapped the camera repeatedly. I got pictures of most of the runners but haven't included them all here. If anyone wants a large copy of a photo from the bridge, send me your bib # and I'll hunt for it in the collection I took. This morning volunteers and staff began working on the modified finish area in Scott Park. Posts and ropes will keep spectators away from the new finish line (that yellow banner). follow the path by the river to the shelter on the far right. Tomorrow runners and crews can spread out over this large grassy area while they swap trail stories and eat their post-race BBQ. Later today a large food tent was erected near the parking area. Tomorrow afternoon awards will be given out to the 30K and 50K runners from the bandstand. 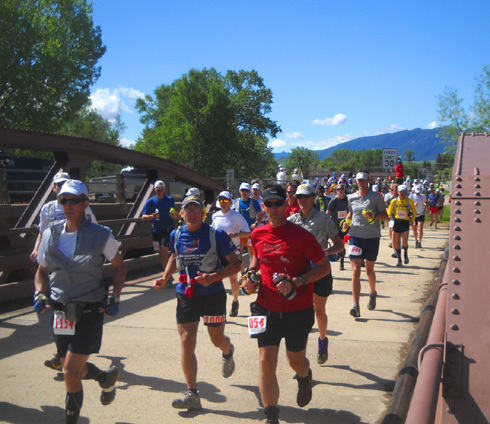 The 50- and 100-milers receive their awards on Sunday morning in Sheridan. ago after their dog died. Cody (and Tater, before she died) loves playing with it. Cody's stronger than he looks but Anne held her ground. Anne and I are amused by something Jim said. 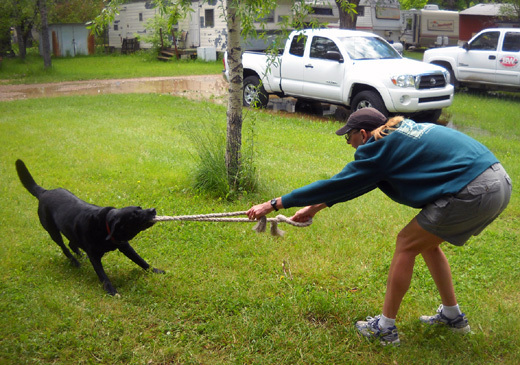 Cody's still focused on that rope.